- The company is a renowned name in the field of Beauty Salon & Spas products indulging in Manufacturing, Imports, Exports and Supplies of the beauty trade. We are distributor of all buauti parlor Hardwares like chairs, massage bed, spa, shampoo solution, trimmers, dryers, all branded and herbal beauty creams in very economical price. 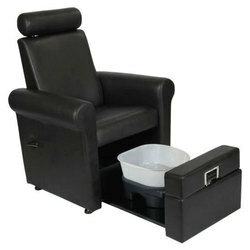 Omega Foot Care Chair – The patient chair that leaves nothing to be desired. - This is a multi-purpose trolley used in the salons. • Painless and non surgical way to remove fat and cellulite. Beautiful design, Euro standard mixture and shower, Adjustable basin, Steel handle with wooden grip, heavy fiber base.